Johannesburg is not only a gateway to other regions in South Africa, it is also a portal to other countries on the African continent. The Oliver R. Tambo Airport, the largest in Africa, is welcoming, modern and easily navigated. Oliver Tambo, after whom it was named, was the president of the African National Congress (ANC) from 1967-91. Accessibility and ease of transport make Joburg a natural stop to rest, regroup and explore the country's unique history prior to embarking on additional adventures. 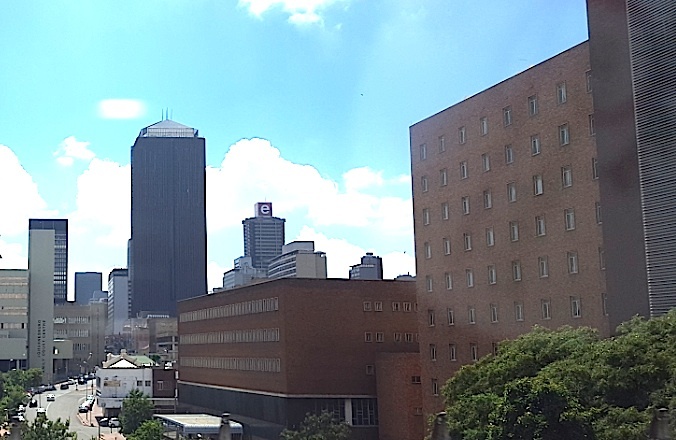 Joburg is Africa's second largest city and largest city in the world not built on a substantial body of water, was founded as a gold mining town in 1886 and named after Johaiin Rissik and Christian Johannes Joubert. After gold was discovered a mining industry quickly grew up that brought people in from around the world, employed African workers and laid the groundwork for what would become the infamous system of Apartheid. A best bet for a comprehensive visit is the Hop On Hop Off City Sightseeing Joburg & Soweto Tour. It is regularly scheduled daily, makes nine stops that include all the major attractions and sites, features sixteen languages and is a real bargain for the money. One or two-day tickets are available. Tours begin at the Gautain Train Station. Gold Reef City, a mining-themed park, explores the industry and heritage of mining in South Africa. The park is located on a defunct gold mine and includes thrill rides, a 4-D theater with hydraulic seats, a museum, a casino and an underground mine tour. "Jozi's Story of Gold" tour is a must. The casino is open 24-hours and showcases some of the best live jazz performances in the region. I must mention that Johannesburg has a zoo. 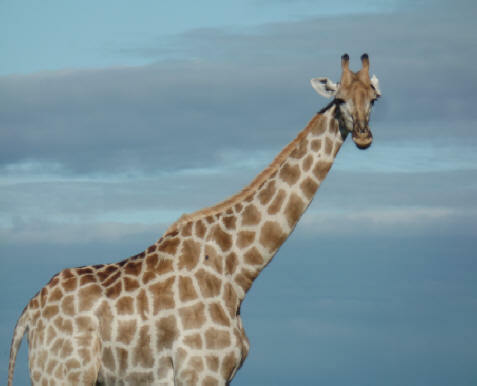 Even though the surrounding regions are rife with game parks the Johannesburg Zoo has something not found anywhere else within Africa. It is home to two polar bears and people love them. The city has various nicknames and one of the more popular is "Egoli," place of gold, because it is situated on the fringe of the largest known gold deposit on the planet. 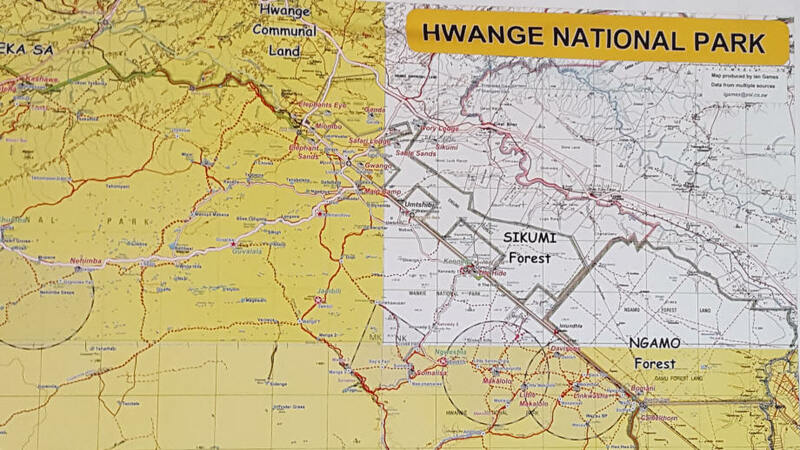 Originally the name referred to the gold that was found there in the 1800s, currently it references its status as the economic hub of the country. Sandton, one of the city's neighborhoods is known as the "richest mile in Africa." The Carleton Centre was constructed in 1973 and from its Observation Deck visitors can get a panoramic view of this very cosmopolitan city. "Jozi," yet another name, is coming into common use as more befitting of this hip, edgy, multicultural mecca. Jozi's streets offer designs from global trendsetters as well as Rockey Street's West African Market. A stroll here is like a walk across Africa. Many country's wares are sold including unique works of art. Dining around town is also highly reflective of global influences whether eating from a street vendor or indulging in a meal in an exclusive eatery. All food is fresh, locally sourced and created using combinations of spices that conjure up pictures of exotic ports. The prices are incredibly reasonable and the portions tend to be large. One must also note that South African wines are some of the best on the planet. Constitution Hill is one of the most significant sites in the entire country and it bears witness to South Africa's unique history in all of its incarnations. Entrance to the complex is free but some of the interior exhibits require a nominal fee. In 1896 it became the site of Johannesburg Fort, built atop a hill, and later a prison complex. Ultimately it was the location of the infamous Number 4 Prison, used to house political prisoners and known for the grueling and inhumane treatment inmates suffered. In 1909 a female prison was added and it was there that Winnie Madikizela-Mandela was held. Nelson Mandela was held in Number 4 while awaiting trial in 1956. Visitors can view a Mandela exhibit and his cell. Gandhi was incarcerated four times in the prison and a bust of Gandhi was placed on the grounds in recognition of his role in South African history. In 1995 the first justices were appointed to uphold the new constitution and a decision was reached to establish the permanent Constitutional Court on the old prison grounds. 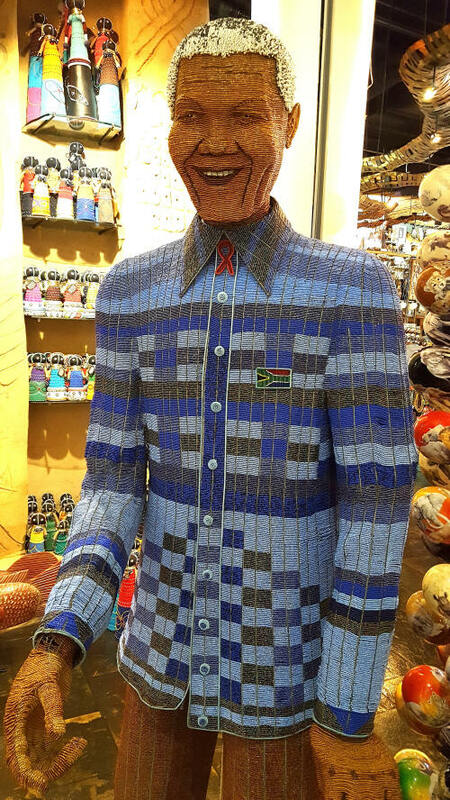 The architects captured the emerging vision of the new South Africa while showcasing the traditions and heritage that support and bind the old and the new. The prison and court areas are linked by the "Great African Steps." The path is built of reclaimed red bricks from the prison. 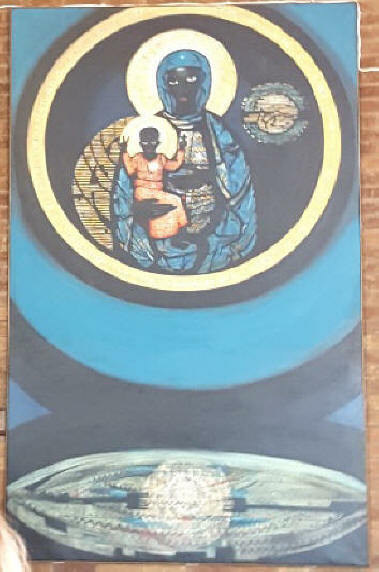 The overarching theme of the complex, "justice Under a Tree," references the historic fact that African village justice was meted out by wise men who often met beneath a tree. The entry doors are 26-ft. high with the 27 Constitutional clauses carved on them. The Constitutional values are etched on the ceiling beams in all eleven of the official South African languages. An eternal Flame of Democracy was lit in 2012. 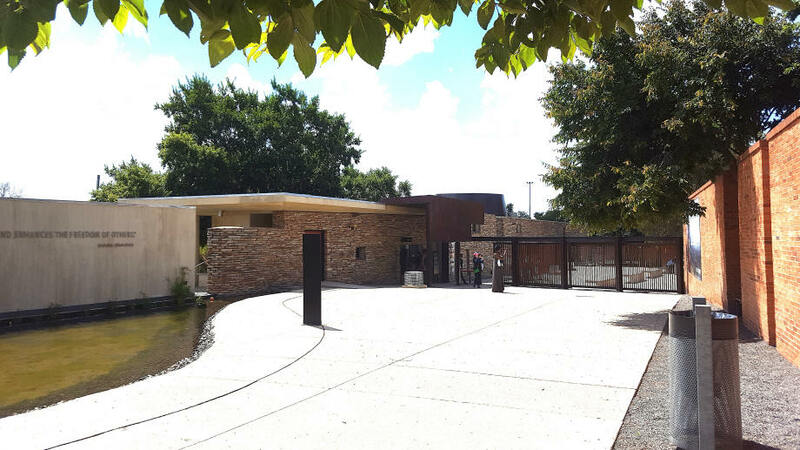 This complex is both historically and architecturally outstanding. A premiere photo opportunity is found in Sandton in Nelson Mandela Square. In 2004 a 265-ft. tall bronze statue, 8-ft. wide, of Nelson Rolihlala Mandela was erected. Statues of Mandela tend to pose him in a power stance. This statue depicts him with arms outstretched, embracing the world and inviting you to visit Johannesburg. Africa is not a country but a continent and as such it has been the subject of conjecture, misconception and myth. The Republic of South Africa is approximately 471,008 square miles in size and contains almost every precious stone, mineral and metal including chrome, cobalt, copper, diamonds, gold, manganese, nickel, platinum and titanium. Archeological evidence points to South African mining as early as 250 BC. The country's riches quickly became fair game for Europeans entering what they considered "empty" land and these two factors would prove significant in the establishment of the system of apartheid that relegated indigenous Africans to second-class citizenship. 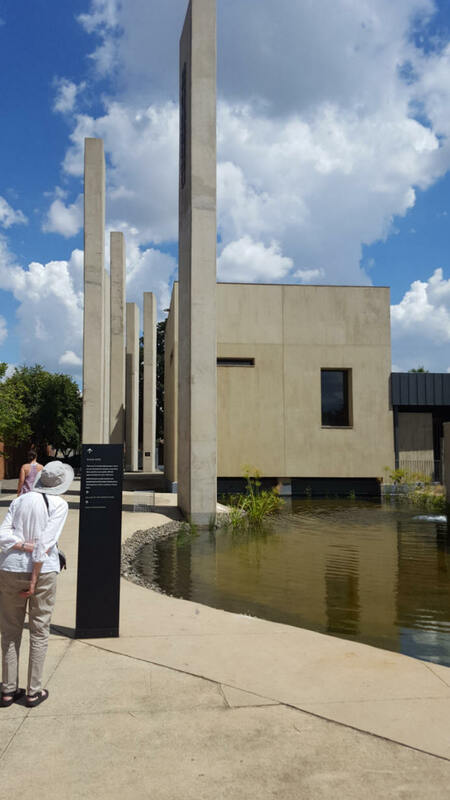 Johannesburg was ground zero for the struggle to end apartheid and as such it houses the memorials, sites and museums that best interpret this history and that of the cultures involved. 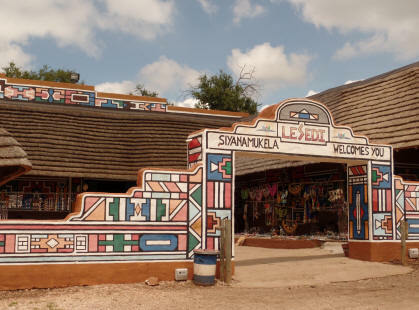 Lesedi, "Place of Light," Cultural Village is an absolutely wonderful, interactive experience into tribal South Africa. 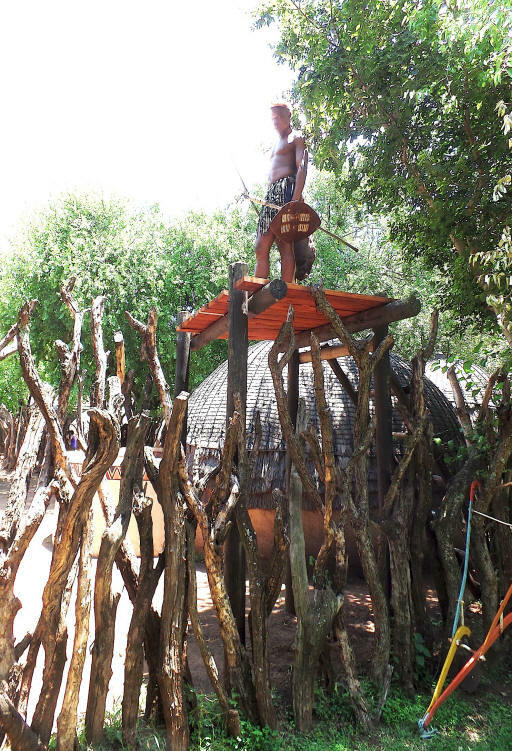 The outdoor living history museum complex was established in 1995 and consists of five traditional villages that are built and populated by members of each tribe. The cultures showcased are the Basotho, Ndebele, Pedi, Xhosa and Zulu. 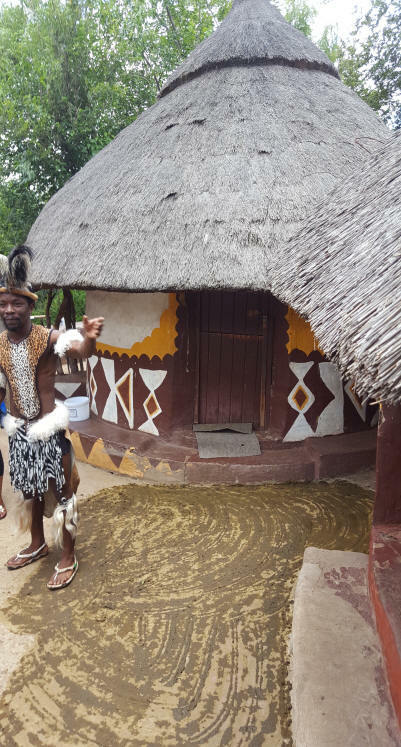 Visits begin with a traditional African welcome onto the grounds.. The official program begins with an orientation film followed by a hosted walking tour of individual villages. In each homestead villagers present information on and demonstrations of their dress, customs, rituals and architecture. Guests return to the dance "boma" for a performance presented by each group using customary instruments and dance accouterments. 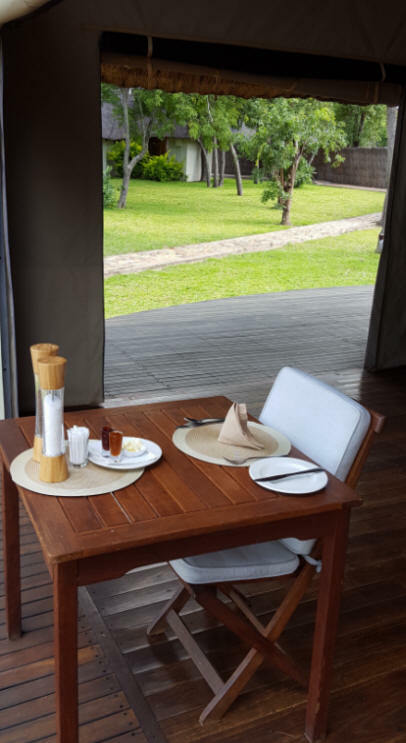 The formal program ends with an extensive feast with music and a buffet of standard African fare.The official program begins with an orientation film followed by a hosted walking tour of individual villages. In each homestead villagers present information on and demonstrations of their dress, customs, rituals and architecture. Guests return to the dance "boma" for a performance presented by each group using customary instruments and dance accouterments. 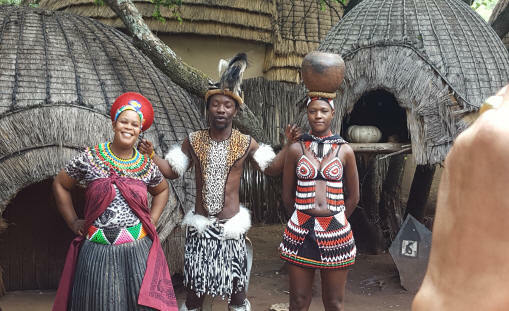 The formal program ends with an extensive feast with music and a buffet of standard African fare.The official program begins with an orientation film followed by a hosted walking tour of individual villages. 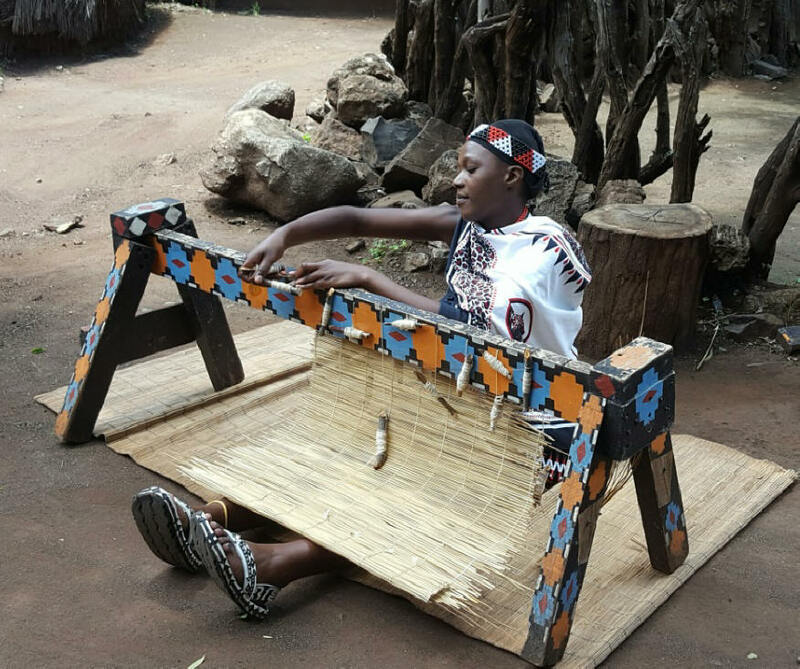 In each homestead villagers present information on and demonstrations of their dress, customs, rituals and architecture. Guests return to the dance "boma" for a performance presented by each group using customary instruments and dance accouterments. 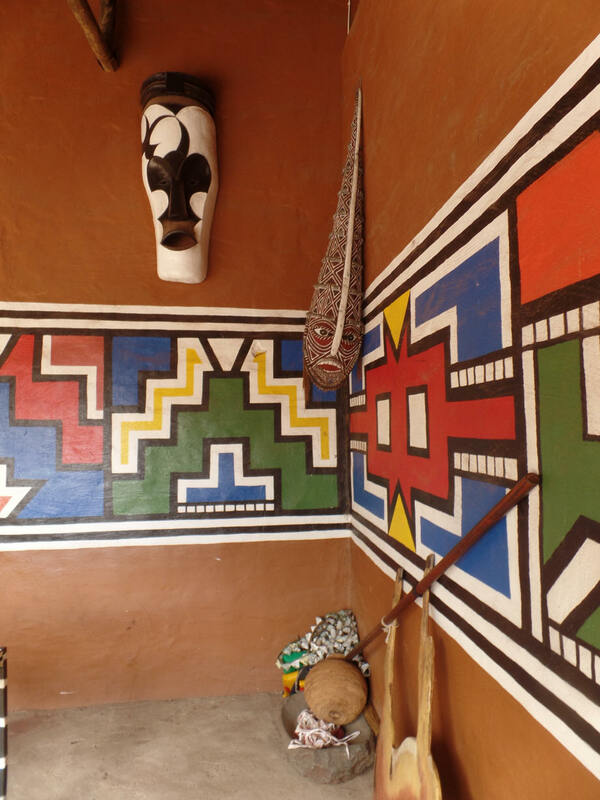 The formal program ends with an extensive feast with music and a buffet of standard African fare.The official program begins with an orientation film followed by a hosted walking tour of individual villages. In each homestead villagers present information on and demonstrations of their dress, customs, rituals and architecture. Guests return to the dance "boma" for a performance presented by each group using customary instruments and dance accouterments. The formal program ends with an extensive feast with music and a buffet of standard African fare. Diamonds and gold were discovered in South Africa in 1867 and 1876. Their discovery led to a crush of "outlanders" and led directly to the Boer Wars in 1899-1902 and the formation of the Union of South Africa in 1910. Repression of native Africans (Bantus), Coloreds and Asians led to the founding of the African National Congress (ANC) 2-years later. As part of the system of Apartheid non-whites were marginalized and in 1950 the Group Areas Act demanded that nearly 2-million Africans be removed from cities and made to live in poverty-stricken, highly regulated townships. Soweto, South Western Townships, the most recognized of the townships, was first settled at the turn of the 20th-century when men left rural villages to labor in the mines. In 1948 the government began forcing black Africans out of Joburg and into Soweto. The township was located on land that was polluted by the mine and designed to promote control of the inhabitants. Houses could be no larger than 4 rooms of equal size with no public services. Streetlights were not installed until 2010. 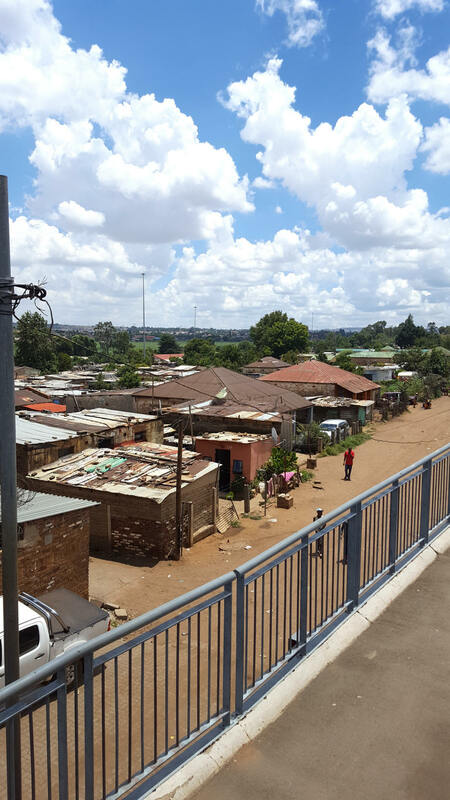 Soweto, the most densely populated township with approximately 1.5-million residents, is a mere 10-miles from Joburg. Soweto protested apartheid vigorously and in 1976 the Soweto Rebellion led the charge to dismantle the system. More the 170 students were killed. In 1985 riots broke out again and continued until apartheid ended. 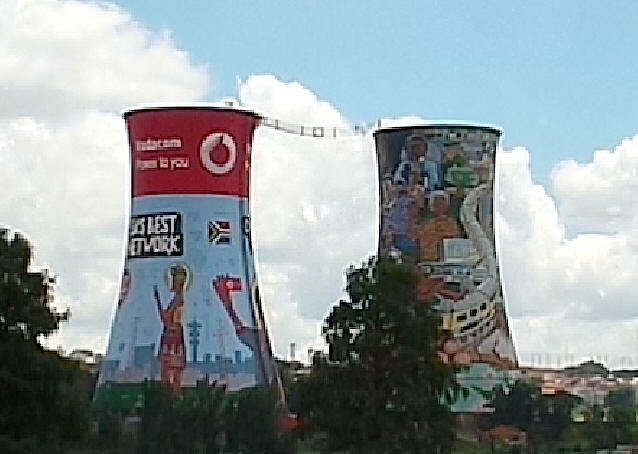 Tourism has become an economic engine for the people of Soweto and several tour companies offer guided tours. There are few street signs or maps so I strongly suggest that you book a tour or be accompanied by a resident. There are a number of historic sites that are well worth the trip including the Chris Hani Baragwanath Hospital, the largest in the country. 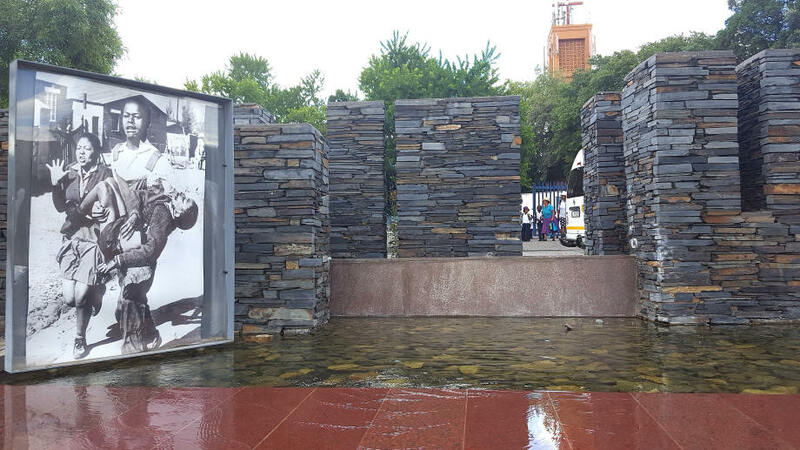 Walter Sisulu Square of Dedication was the site of a gathering in 1955 of 3,000 people to adopt the Freedom Charter. It was used as a model for the current constitution. 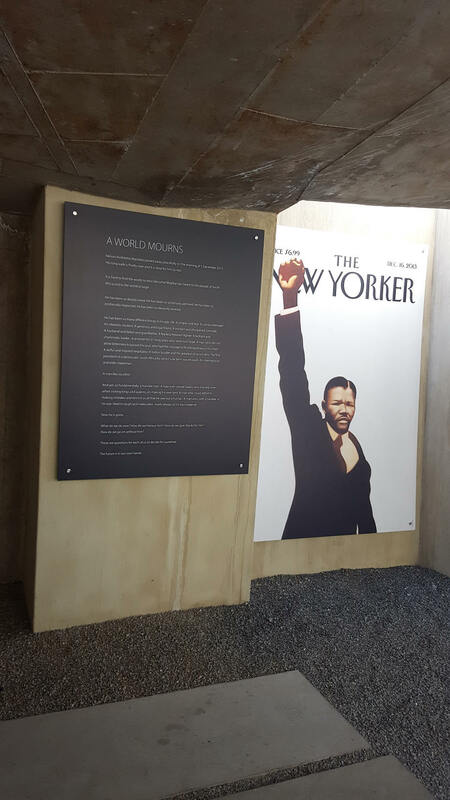 Ten pillars represent the clauses of the charter and a museum provides insight into the movement.Walter Sisulu Square of Dedication was the site of a gathering in 1955 of 3,000 people to adopt the Freedom Charter. It was used as a model for the current constitution. Ten pillars represent the clauses of the charter and a museum provides insight into the movement. In 2002 the Hector Pieterson Museum and Memorial was inaugurated. The museum is currently closed for repairs but visitors can access the stunning memorial. Thirteen-year old Pieterson was killed in the 1976 Student Uprising. A photograph of the dying Pieterson being carried by another student gained international attention. 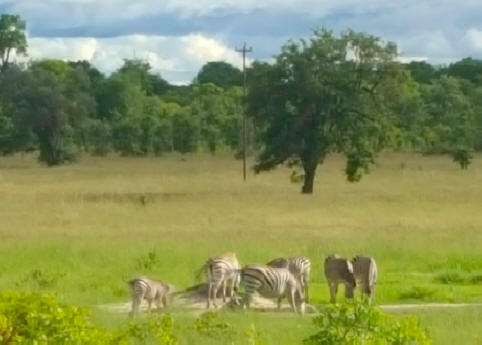 The Republic of Zimbabwe, bordered by Botswana, Mozambique, South Africa and Zambia, is easily accessible, has a developed infrastructure, uses the American dollar as standard currency and boasts several of Africa's most significant historic and natural attractions. There are five UNESCO World Heritage Sites within its borders. 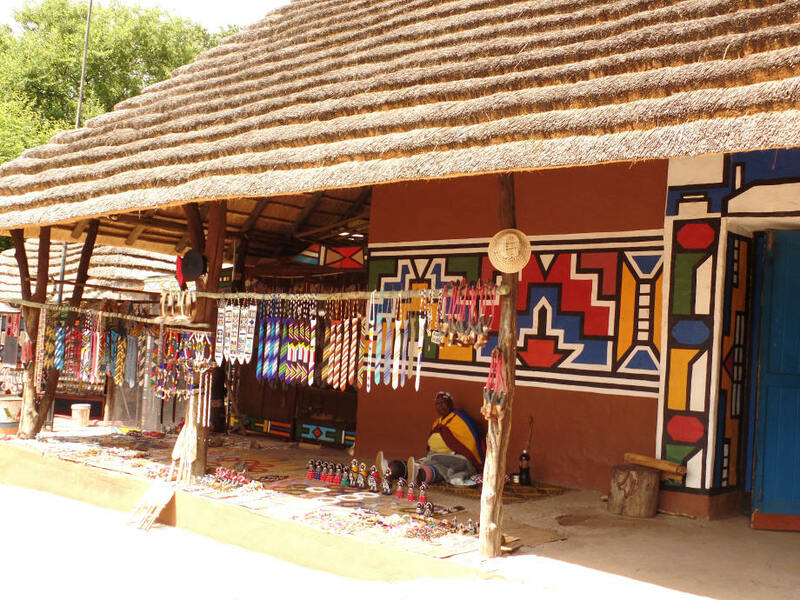 The area has been an important trading center since 900 AD when the Mashona people traded their primary trade item, gold, with other cultures. Zimbabwe's "stone houses" were the traditional homes of the rulers and although more than 180 of these ruins exist the most significant was the capital of the Kingdom, Great Zimbabwe. This 1,720-acre complex, located between the Zambezi and Limpopo Rivers, at its height housed more than 15,000 people and is the largest sub-Saharan collection of ruins on the continent. There are two main complexes, the Valley Enclosures and the Great Enclosure and at some points the walls, constructed of granite blocks without mortar, reach a height of 37-ft.and a width of 20-ft. 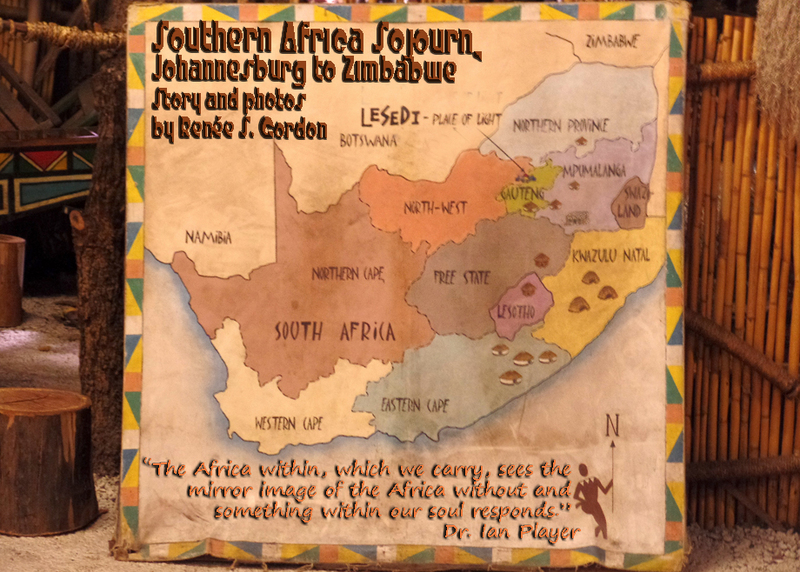 Eight soapstone Zimbabwe birds were carved here atop a series of columns and are now depicted on the country's flag. The birds have lips and feet instead of a beak and claws. Artifacts found at the site are featured in an on-site museum. The monument, a UNESCO World Heritage Site since 1986, is open Mon-Sat. 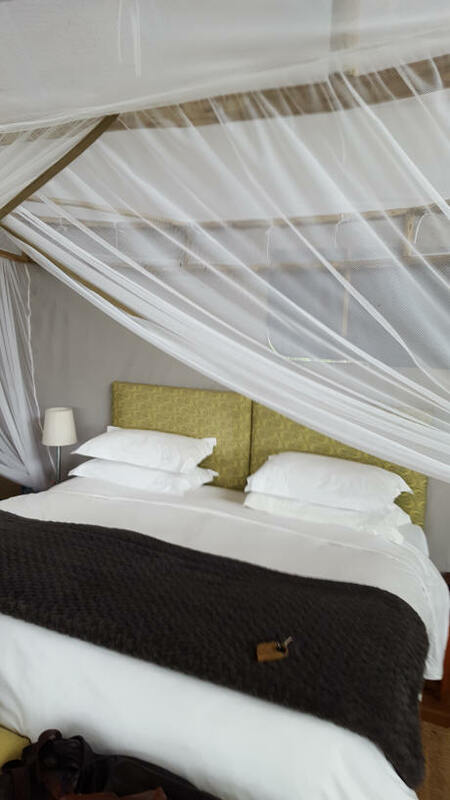 There are numerous types of accommodations from which to select in the Hwange area, from camping to luxury lodges, for all budgets and to match your African dreams. If your desire is the ultimate "Hemingwayesque" adventure while basking in luxury, Elephant's Eye Lodge is the natural choice. Just as elephants originated in Africa, are majestic and the only large animal capable of shaping their environment to suit their needs, so too is Elephant's Eye Lodge iconic and the staff is dedicated to crafting your fantasy safari adventure. 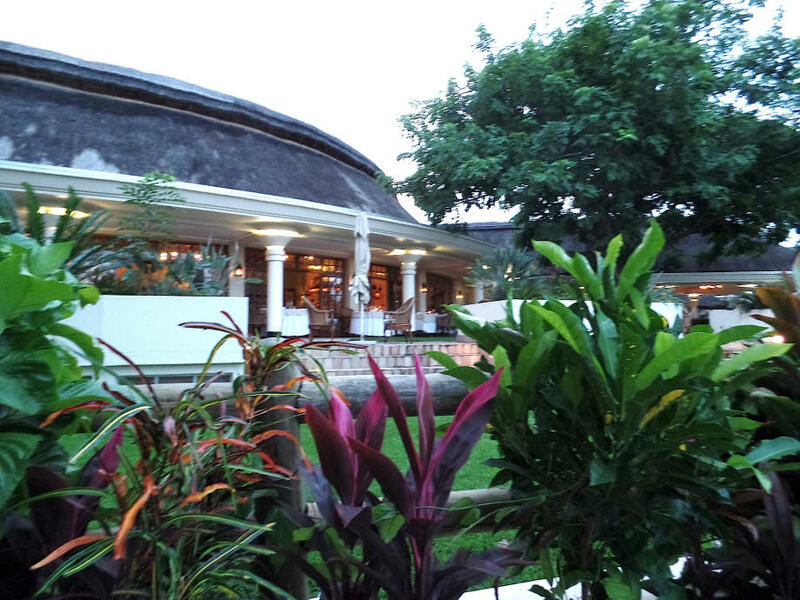 Elephant's Eye is situated just outside the park and is completely environmentally friendly. 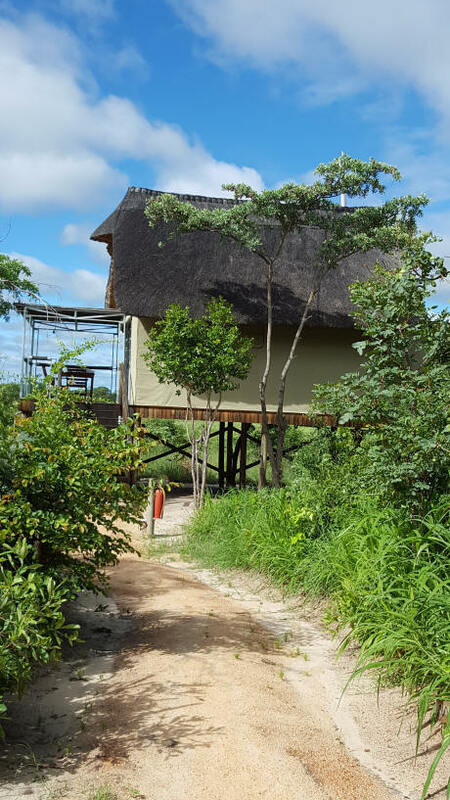 The complex is comprised of the main lodge area and eight deluxe chalets, tented and built atop stilts, with commanding views of the waterhole below for game sighting and sunrise and sunset viewing. Suites have netted beds, a fireplace, wireless Internet, designer amenities and an awesome outdoor shower. 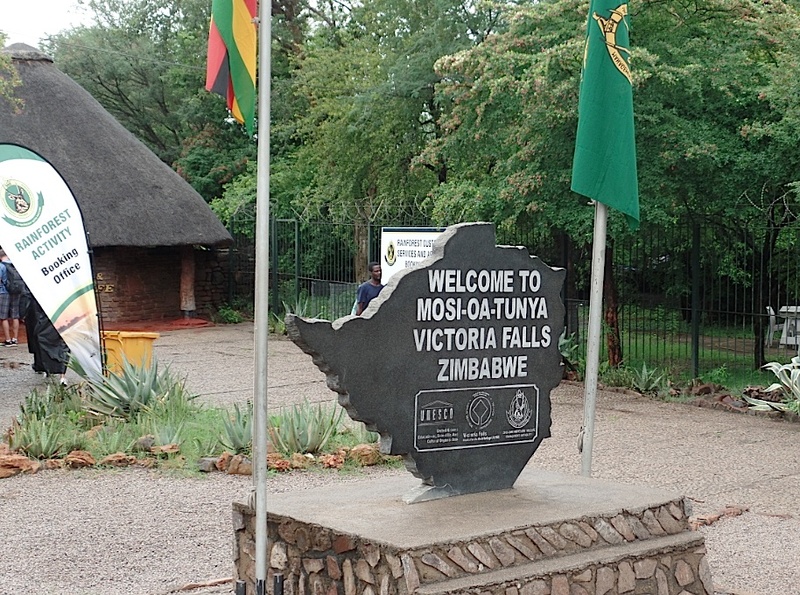 A 90-minute drive from Hwange along a main road is Zimbabwe's greatest jewel, Victoria Falls. White settlers began encroaching into the region in earnest in the 1880s and in 1888 the British South Africa Company, led by Cecil Rhodes, traded money and guns for the region's mineral rights. Salisbury was founded in 1890 and is today the capital Harare. War was inevitable and the natives were conquered, the country colonized by the British and the land renamed Southern Rhodesia in honor of Rhodes. Natives were forced onto reservations and their lands were given to white settlers. Two laws, in 1930 and 1969, declared it illegal for a black to own land in a white area. In 1965 Rhodesia declared the Unilateral Declaration of Independence when a division developed with Britain over colonial policies. On April 18, 1980 Zimbabwe gained independence. 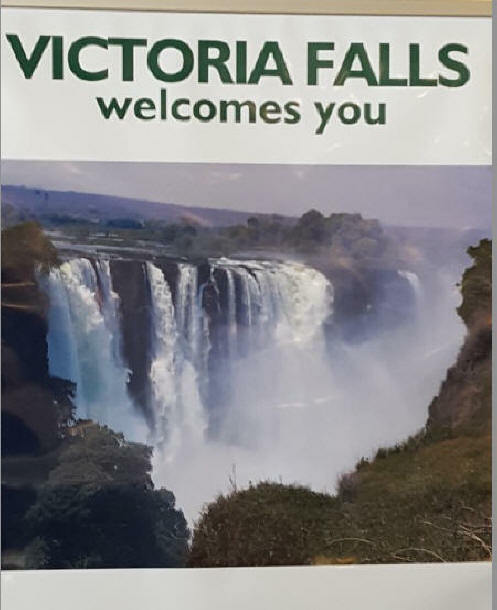 Victoria Falls is spectacular in every season. They are more than a mile wide and nearly 145,300,000-gallons of water pour over the basalt cliffs every 60-seconds. 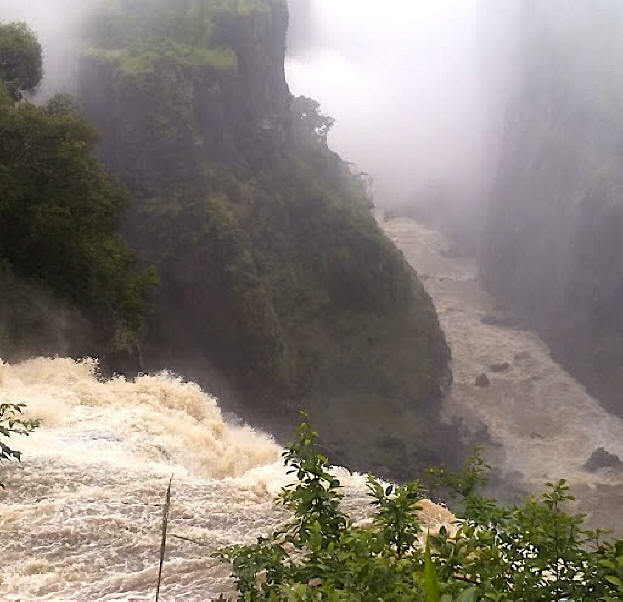 Of the five falls, four are located in Zimbabwe, The Devil's Cataract, Horseshoe, Rainbow and the Main Falls. A paved path allows visitors to walk along the falls and view them from several vantage points. 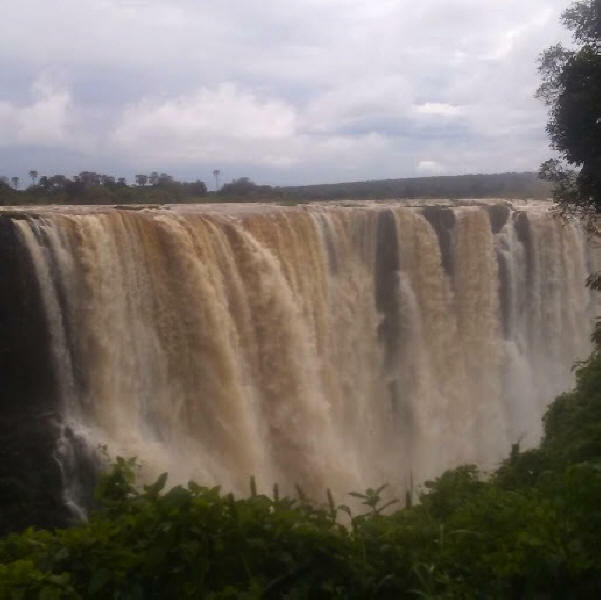 It can be completed in 90-minutes depending upon your interests and the number of stops you make and if you elect to take the 73 steps down into the gorge to the Cataract Viewpoint. The David Livingston statue provides a perfect spot for a photo op as is the rainforest portion of the path. 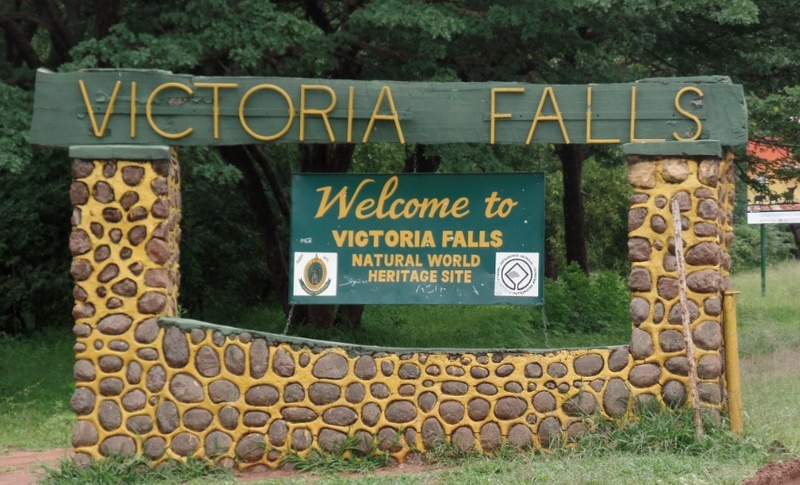 The town of Victoria Falls is also a destination for active adventure. 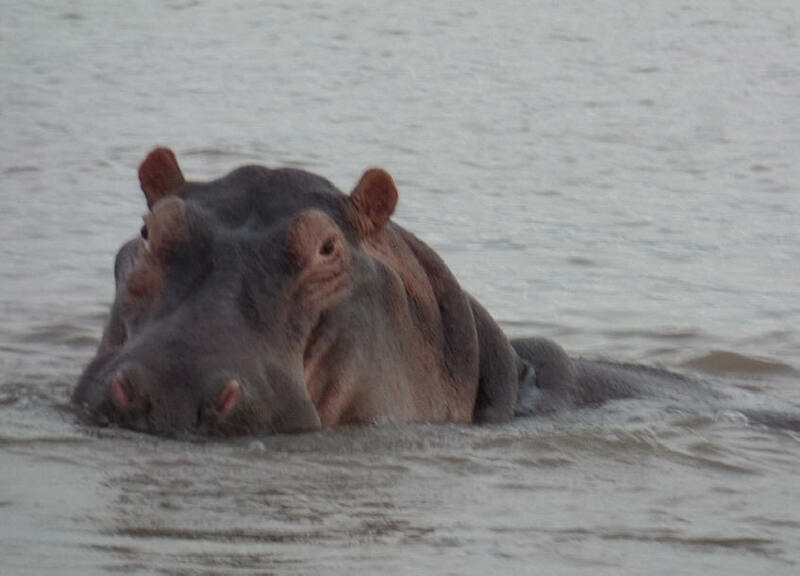 Boat cruises, helicopter tours, safaris and bungee jumping are just a few of the offered activities. A private charter, the Ra-Ikane departs daily for a guided sunset cruise complete with dining, drinks and spectacular views of Zimbabwe and Zambia. The boat replicates Livingston's Ma-Robert boat and named in honor of his most important African guide.